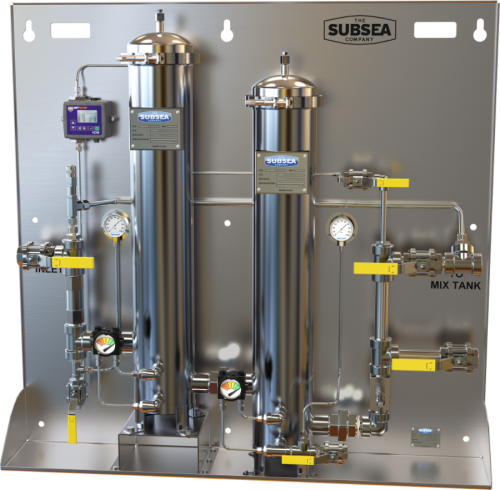 The Subsea Company adds NAS/ISO fluid quality monitoring to their innovative BOP Fluid filtration product line. This low cost panel can be mounted on the mix tank or supplied on a skid with and without a recirculation pump. The BOP Fluid Quality Monitoring system continuously measures the ISO or NAS level fluid cleanliness prior to passing it through a series of filters. The user can select from a range of available filter pore sizes. Offshore Blow-Out Preventer (BOP) fluids are critical to the reliability and functioning of the BOP control system. These water based fluids and make-up water supply are normally tested by taking daily or weekly samples that are sent to a lab onshore. This periodic testing may completely miss or at best delay the corrective action of an event of poor quality fluid that has made its way to the BOP equipment. Our customers can rely on our exclusive BOP Fluid Monitoring system to improve their BOP fluid quality and reliably capture data that will allow them to track fluid quality and improve their subsea BOP control system reliability.